The Log report contains the message output generated from running flows. This information includes the steps taken during data extraction, table creation, and data load, and any errors that occur. The report can include the entire log, or the log for a specific time period. For process flows, the Log report provides drill-down capabilities, which allow you to select entries that display details of the logs of the individual flows in the process flow. The Statistics report contains statistical information about flows, such as how many rows were written, when the flow ran, and how long it took. The report can include all statistics, or statistics over a specific time period, for all flows, or for different types of completed flows. The Statistics report is a drill-down report, which allows you to select entries that display details about the individual flows. Note: Statistics are not available for XML files described by multi-segment synonyms, or for flows that use load type Insert records from memory. The Summary Flow Report flow contains information about all of the flows in the server path or in a specific application directory. It includes the flow type, application directory, description, modify date, and creator. DataMigrator reports support flow names of up to 64 characters. The DM log and statistic tables are not updated with messages when flows are initiated using Run, from the Run group, or context menu. The Log report displays the messages generated by the flows that have been run from the DMC. In the navigation pane, expand the Workspace folder, followed by the Logs and Traces folder, as shown in the following image. Double-click DataMigrator Log and Statistics or right-click it and click View. The Log and Statistics window opens, as shown in the following image. From the Report Range drop-down menu, select Last, All, or Specify Time. Optionally, specify a Flow Name. The report opens in the workspace, as shown in the following image. Note: For process flows, you can drill down to details of the flow components by double-clicking the blue Job ID line. Date and time of log entry. Message strings in the log. Note: If a log message contains a non-zero return code, the line will be shown in red. The Statistics report provides information about the flows that have been scheduled or submitted from the DMC. The Statistics report also provides access to the message log of each flow. 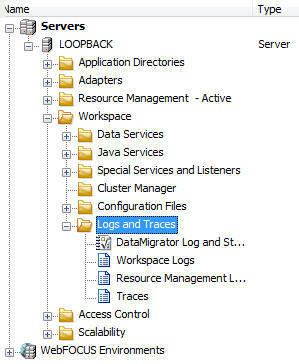 In the navigation pane, expand the Workspace folder, followed by the Logs and Traces folder. Double-click DataMigrator Log and Statistics, or right-click it and click View. The Log and Statistics window opens. From the Report Type drop-down menu, select Statistics. From the Completion Status drop-down menu select All, Completed, Completed Successfully, or Completed with Errors. The report opens in the workspace. To view the message log for an individual flow, double-click its Link to log. Failed flows will be shown in red, as shown in the following image. User ID which executed a request. Flow name and target name. Start and end, submit and retrieve, dates and times. Return codes and any error messages. Total number of transactions, as well as accepted transactions, rejections, and changed and deleted records. Job ID as a link to the flow log. Start date and time of execution. End date and time of execution. Total run time for the flow. Internal return code for the flow. Original flow where dependency started. Original user ID running dependent flow. Text explanation of error messages. Total CPU time in milliseconds. Note: This, and the remaining columns, apply on a per target basis. Number of rows rejected by the database for a constraint violation, such as a Unique Index constraint, a Not Null constraint, or a user-specified constraint. For a file target, the number of rows rejected due to format conversion errors. Number of rows rejected for failing validation tests. Number of rejected duplicate records. 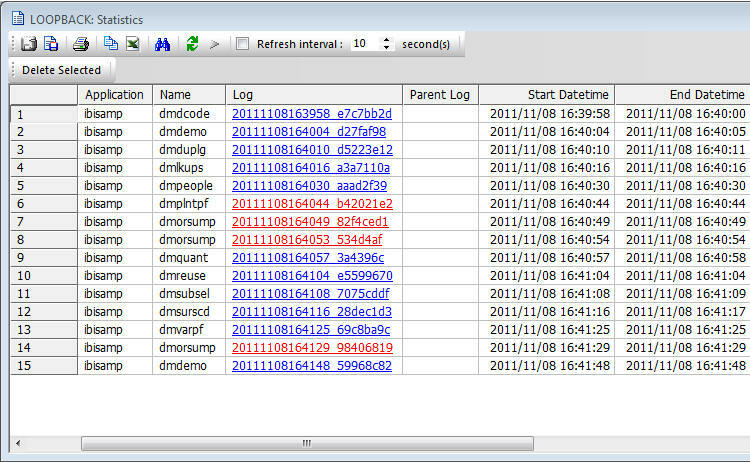 To access the Log and Statistics window shown in the following image, double-click DataMigrator Log and Statistics, which is found in the Logs and Traces folder in the navigation pane, or right-click it and click View. 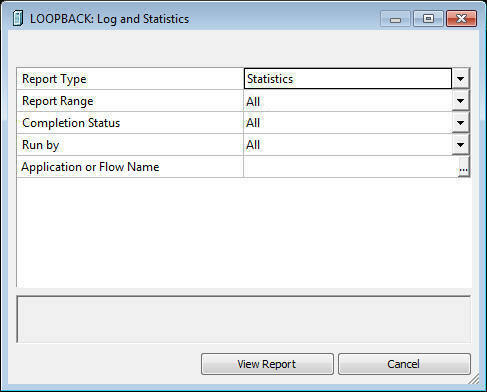 Enables you to generate either a log or statistics report by selecting either option from the Report Type drop-down menu. Allows you to select what time range you want to run the report for. The options are Last, All, or Specify Time. If Specify Time is selected, an area opens where you can specify the start and end date and time. If Statistics is selected, the default value is All. If Log is selected, the default value is Last. Allows you to view all reports, completed reports, reports completed successfully, or reports completed with errors. This option is only available when running a Statistics report. Allows you to view reports for all flows, and those initiated by the scheduler or submit. This includes flows initiated from the DMC, WC, and CMRUN. Allows you to specify a specific flow or procedure to run the report on. If you select the Statistics Report Type and All as the Report Range in the Log and Statistics window, you will get a report as shown in the following image. To view the log report, double-click a log in the Log column, or right-click a log and click Show Log. If the log has output, right-click the log, and click Output. You can view a different log report by closing the one that is open and selecting a different log report hot link from the Statistics report. To delete a log and its output, select its corresponding check box, and on the Report tab, in the Tools group, click Delete Selected. A Summary Flow Report displays all of the flows on the server or in a specific application directory. In the navigation pane, right-click Application Directories or a specific application directory folder. Select Impact Analysis, then Flow Report, and then Summary, as shown in the following image. If you select to view the report from Application Directories, all of the flows will be included. If you selected a specific application directory, the flows in that particular application directory are displayed.